I just wanted to check in and say thank you for all the wonderful comments on the wallet I designed. I’ve had a few commitments pop up that I’ve had to take care of. I hope to post a template and directions for the wallet within a day or two. My Dad’s birthday is coming up on the 19th so that’s incentive for me to get busy and make a couple more. 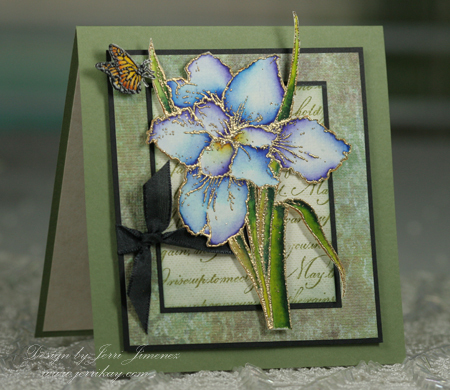 I don’t have anything new to share today, but I would like to share with you a design I did last year when Flourishes debuted this gorgeous iris illustrated by Marcella Hawley. I think it’s still my absolute favorite Flourishes stamp. Thank you for stopping by, I wish you all a blessed day! This is so gorgeous Jerri! I have seen some of your designs with this flower IRL and they are just spectacular! So precious! This is still one of my favorite cards that you did. It’s beautiful!! Your card is stunning! I love that you added a butterfly. Wow…I LOVE Iris…this is beautiful! I only wish that they would stay in bloom longer…this will be my standby. Jerri, this is beautiful. The flower is gorgeous and sure feels like spring. Great job! How absolutely gorgeous!! Your coloring is fantastic and into my notebook of favorites it goes! This card is absolutely stunning! Love, love, love your daffodil card. The colors you chose are gorgeous and definitely make the flower come alive. Beautiful, and I like the script background and the butterfly is such a sweet touch! SO GORGEOUS!! What a beauty, Jerri. Your coloring/painting is perfection as always. Oh my! This is just beautiful! I love how you have the butterfly swirling about near the flower — WOW! Jerri, this is truly stunning, my friend!! You can sure watercolor like nobody’s business!! Thanks for sharing this, it is more than wonderful and a Joy to view, i can’t even imagine making such a beautiful work of art. This is so stunning and gorgeous, Jerri!! You know I LOVE it, girl!! Just beautiful, Jerri! Gorgeous. Wow! Jerri, this is another amazing cards of yours! I love the softness of it and it is gorgeous, gf! I’m with you about this being your favorite Flourishes image…It’s mine, too!!! Your coloring and embossing on this are sooo spectacular….love the colors and the beautiful background , too!!! Another gorgeous design, Jerri….love every little detail!!! Fabulous looking card!!! I love how you emboss your images and the water coloring is once again fab too!!! Oh, I remember seeing this card in your gallery! I thought it was stunning then, and I still do. Probably the most beautiful card I’ve ever seen with this stamp. It is a gorgeous stamp, too! If I saw the card, I don’t remember because my memory stinks, but the card is worth seeing again because it is fantastic. Thanks for showing it to us.